Last week, I blogged an original story about a new Washington DC-based Russian disinformation campaign that was the culmination of over a month’s research. The story was subsequently picked up by The Daily Beast and cited in The Washington Post and Politico daily round-ups. At the helm of the project is Alexander Malkevich, a Russian media executive and a member of the Civic Chamber of the Russian Federation, a body created by President Vladimir Putin in 2005 to advise government policymaking. Malkevich sits on the Civic Chamber’s commission on mass media and communication. He is also running the show at USA Really, according to an FAN video on the project. The video features shots of a USA Really office space adorned with an American flag, a Confederate flag, and a framed “Make America Great Again” poster of President Donald Trump. The FAN claimed on its website that it subsequently spoke with the MPD, which also denied them a permit and warned that they had alerted the CIA, which does not operate on U.S. soil, of USA Really’s activities. MPD told Dean Sterling Jones, a Belfast-based investigative writer who’s followed the USA Really case for weeks and first reported Malkevich’s involvement, that it had received no requests for a rally permit from the group. For all its talk of combating misinformation, USA Really appears to be as invested in vendettas as it is in truth-telling. On Saturday, Jones received a diatribe from someone named Michael using a USA Really email address in response to a post he’d written on the group. 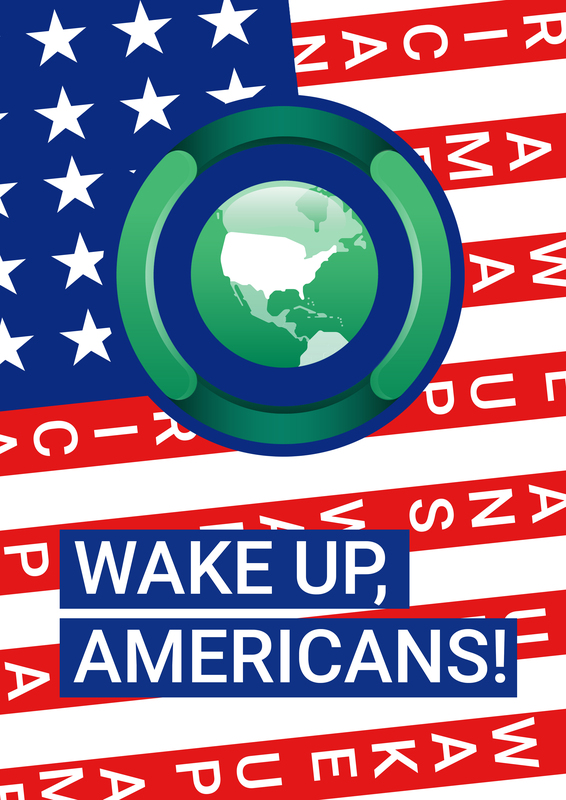 For the past month, I’ve blogged extensively about “Wake up, America!”—a mysterious “Russian ops” campaign that recently made headlines after it attempted to organise a flash mob event at the White House to celebrate Donald Trump’s upcoming 72nd birthday. Organisers appeared to cancel the event—which would have included a symphony orchestra—after mistakenly applying for a film permit instead of the proper rally permit, although an article published earlier this week on the FAN website claims the cancellation came as a result of a conspiracy by US authorities to censor its free speech rights (banners advertising the rally are still up on the USA Really website). FAN has been digitally traced to the Mueller-indicted Internet Research Agency (IRA)—better known as the Russian troll factory—by US cyber-security firm FireEye and open-source researcher Lawrence Alexander, among others. In 2015, Adrian Chen of The New York Times visited the IRA’s offices in St. Petersburg and found that FAN was operating out of the same building. 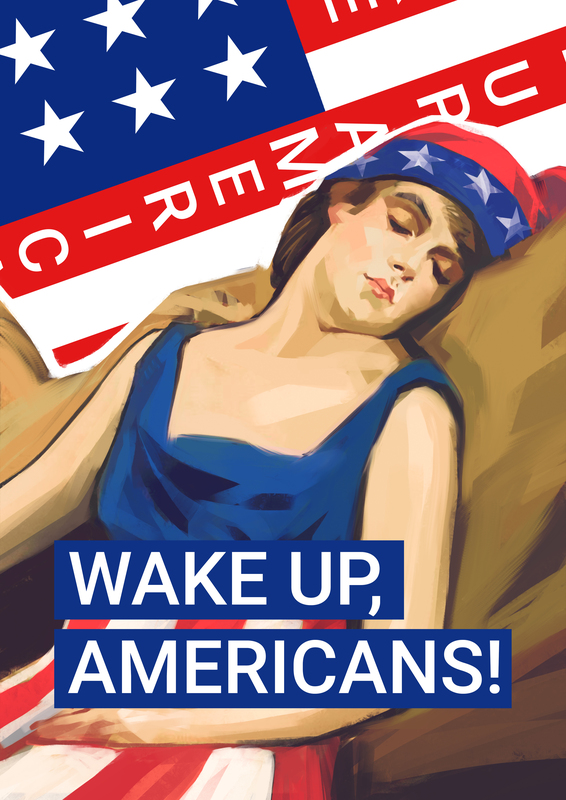 Now for the latest twist in the story: According to a video published Tuesday on FAN’s YouTube channel, the “Wake up, America!” campaign is being headed by the deputy chairman of the Russian government’s Commission on Mass Media and Mass Communications, Alexander Malkevich. The video appears to have been filmed from inside USA Really’s Russian office, which is adorned by US and Confederate flags, a colour-coded map of the US, and a framed picture of Donald Trump. The composition of the chamber was personally approved by Putin himself. Yesterday, Malkevich used the OPRF website to publish an anti-US screed complaining about the negative attention “Wake up, America!” has received in the US, and demanding that the Russian government take legislative action against US news and social media platforms. Our Commission has talked a lot about the discriminatory approach that applies to the Russian media in Europe and the United States. And we have repeatedly made proposals on this topic that Russia needs more mass media in order to fight back in the world information war. In May, in a test mode, a group of enthusiasts launched the information resource “USA Really”. Objective media, young, sincere media. It was honestly and officially announced that he would work in the English-speaking zone, no media outlets violated any laws, only official information, proven materials, no fictions, open real journalism was published. And what happened? After the site worked for several days in a test mode (ie without advertising campaigns and mass mailings about the opening of the resource, it was simply debugging work processes), the Facebook account was completely destroyed, Twitter introduced a number of restrictions: in fact, journalists can not He publish publications with direct links to his site. But there was a blog in LiveJournal (I want to emphasize that this social network is run by a Russian company), which began to develop, Twitter missed direct links to LJ posts, but it did not last long, for a maximum of 24 hours, after which this blog was also blocked. It is clear that this is illegal and this is arbitrary, since the administrators of the blog received no warning messages from the management of the social network. And this makes you ask a whole series of questions. First, there is no vaunted democracy and freedom of speech in the US. The American authorities, without ceremony, without giving any reasons, clean out the information field from everything they disagree with and from all those who do not cuddle or crouch before them. But, once again, why does the Russian company support US sanctions? A law on counter-sentences has been introduced, at the highest level, the introduction of criminal responsibility for those who are ready to support these sanctions on the territory of our country is being discussed. Does this mean that the leadership of SUP media should go to jail for supporting the policy that the US authorities are leading against Russia? With the so-called “freedom of the media” in America everything is clear, because it simply does not exist. But it is fully present in Russia – only in some perverted forms. On the territory of our country, not only the American media that regularly publish libel, but also their subsidiaries, who tell us very coolly and with a spark that Siberia should secede from Russia, that the Crimea is not Russian land and so on. They work in the Russian legal field, they quietly conduct their groups in Russian social networks, they are not blocked, although there is a violation on violation and violation drives. It turns out that Americans can work for us quietly, but we do not. There is discrimination, and with this you need to do something at the highest governmental level. We, both as a journalistic community and as public figures, are certainly outraged by this imbalance – and we are asking the State Duma, the Ministry of Foreign Affairs of the Russian Federation, the Government to support the interests of the media, which are insolently flouted by American companies, and the US authorities, which dictate to them, and to all of us, thus, our will. According to Russia’s business index, Zubarev is FAN’s founder and proprietor. He is also a key figure in Adrian Chen’s NY Times Magazine piece on the IRA, sending a photographer to follow Chen to his hotel and later publishing an article attempting to link Chen to Moscow neo-Nazis. Although Zubarev refused to disclose the names of FAN’s investors, a 2017 investigation by Russian media group RBK found evidence that FAN might be funded by “Putin’s chef” Yevgeny Prigozhin, one of 13 Russian nationals indicted by special counsel Robert Mueller in February for allegedly attempting to interfere in the 2016 US election. Prigozhin has hired lawyers and is fighting the charges in US court. 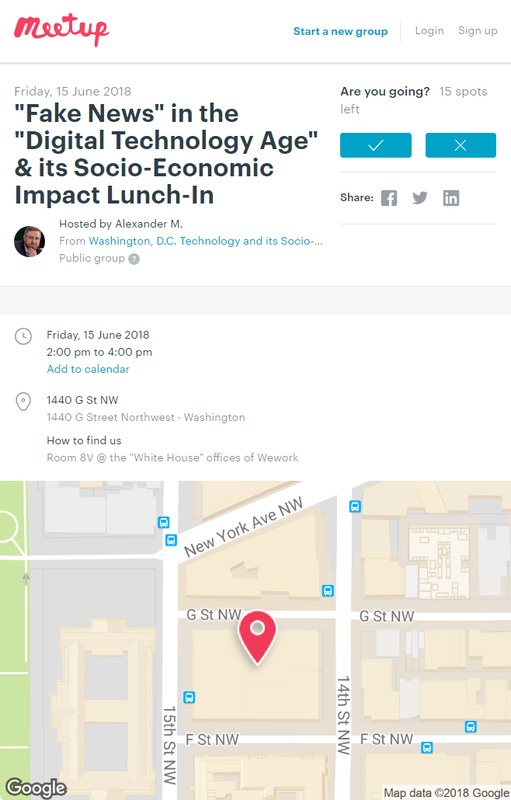 Update, June 10, 2018: USA Really is holding an event hosted by Alexander Malkevich at WeWork White House on June 15. The event is titled “’Fake News’ in the ‘Digital Technology Age.’” WeWork White House is located one block from the White House. For the past month I’ve been blogging about a new anti-US media campaign started by the Internet Research Agency (IRA), better known as the Russian troll factory. In April, my post about the campaign’s recruitment of “English-speaking journalists” was picked up by The Daily Beast, Taegen Goddard’s Political Wire, and Press Pool with Julie Mason. Then late last month, I scooped the story that the IRA is planning to flash mob the White House on June 14, Donald Trump’s 72nd birthday, as part of the new campaign. 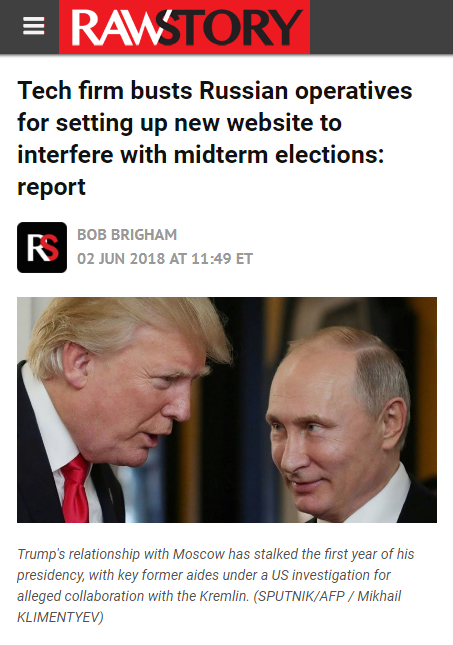 Yesterday, McClatchy DC published its own story about the campaign, “New internet accounts are Russian ops designed to sway U.S. voters, experts say” by Tim Johnson. WASHINGTON—A new Russian influence operation has surfaced that mirrors some of the activity of an internet firm that the FBI says was deeply involved in efforts to sway the 2016 U.S. elections, a cybersecurity firm says. A website called usareally.com appeared on the internet May 17 and called on Americans to rally in front of the White House June 14 to celebrate President Donald Trump’s birthday, which is also Flag Day. FireEye, a Milpitas, Calif., cybersecurity company, said Thursday that USA Really is a Russian-operated website that carries content designed to foment racial division, harden feelings over immigration, gun control and police brutality, and undermine social cohesion. Russians involved in the website work for the Federal News Agency, which is known by its Russian acronym FAN and closely follows the Kremlin line on international issues. Ownership of the agency is not publicly known. Meanwhile, the USA Really campaign is steadily picking up traction, with over 400 Twitter followers within a few days, and a perfect Twitter audit score. Update, June 3, 2018: Raw Story picked up the story. Russian operatives with ties to a notorious “troll factory” under indictment by special counsel Robert Mueller may be preparing to launch an influence operation to interfere in the 2018 U.S. midterm elections, McClatchy reports. Speaking at the end of the Fifth Annual Government Forum on Cyber Threat Intelligence, researchers at the cybersecurity firm FireEye warned of a new effort that mimics the information warfare campaign that U.S. intelligence has concluded Russia conducted to help Donald Trump during his successful 2016 presidential campaign. FireEye, which was a sponsor of the conference, warned of a new website, usareally.com, that appeared on the internet on May 17. The site has posted an average of nine articles a day, in broken english. On May 25, the website teased that their “USA Really” campaign would officially launch on June 14. “Our slogan is ‘The USA As It Really Is!’ We invite everyone who care (sic) about America to come and celebrate with us outside the White House on June 14th at 2pm to congratulate the rest of the country on this triply important day,” the post continued. “We’re all patriots, and we all want everyone else to finally wake up!” they added. The researchers at the cybersecurity firm warned the website’s operators once worked out of the same St. Petersburg “troll factory” known as the Internet Research Agency. Special counsel Mueller indicted the company on February 16. “We’re not saying it (USA Really) is the Internet Research Agency but there are a number of indicators that suggest it is,” said Lee Foster, manager of information operations analysis for FireEye iSIGHT Intelligence. The Russian operatives behind the website reported work for the Federal News Agency (FAN), whose ownership is unknown. It’s been a busy few months for the Internet Research Agency (IRA), better known as the Russian troll factory. In February, the Justice Department issued an indictment to prosecute 13 IRA “kremlebots” for allegedly meddling in the 2016 US election. Since then, the company has been banned from several US social media websites, and details of its operations have been exposed by the media. To mark the launch of the campaign, the IRA is organising a flash mob event to take place outside the White House on June 14, Donald Trump’s 72nd birthday. 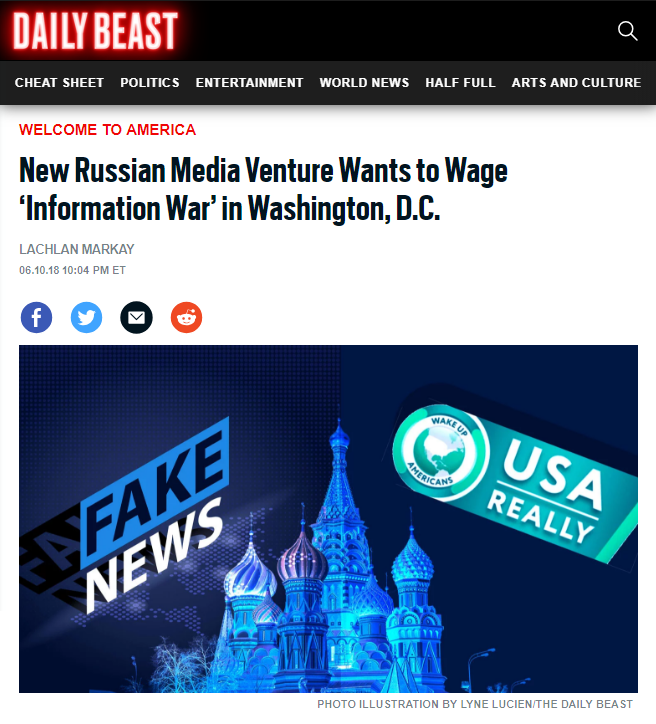 The plans were announced via USAReally.com, a pro-Kremlin propaganda website that has been traced back to the IRA by open-source researcher Lawrence Alexander. The IRA previously organised a number of political rallies during the 2016 election, including an anti-Trump rally in New York that was attended by documentary filmmaker Michael Moore. The website, which was registered last month but only went live earlier this week, includes articles lifted from mainstream US news outlets and other, more nefarious sources. One article, originally published by Russian state-backed news agency Sputnik, takes aim at the Russia investigation led by special counsel Robert Mueller. “All of America is sick and tired of hearing about the Mueller probe, with everyone having already made up their own minds by now about whether Trump’s guilty of ‘colluding’ with Russia or not,” the article reads. Another article, originally published by Alabaman white supremacist, neo-Confederate organisation League of the South, advocates for the secession of Louisiana from the US. The League of the South did not respond when asked if it gave permission for USA Really to re-publish its article. Despite the website’s anti-Mueller leanings, a few articles suggest an emerging anti-Trump bias, including a mocking article titled “Barack Obama Laughs at the Trump’s Administration,” which appears to have been sourced from a similarly worded Fox News item, and another article criticising Ivanka Trump for “a provocative photo” she recently posted to Instagram. It’s not the first time the IRA has criticised Trump. Earlier this month, LiveJournal accounts controlled by the IRA published anti-US screeds railing against “the stupid and random orders of Donald Trump.” The posts came in response to a series of recent controversial US foreign policy decisions that stirred tensions in Israel, Iran, and North Korea. It’s unclear if the anti-Trump posts are merely intended to “sow discord,” as concluded by the Justice Department in February, or if they also represent an ideological pivot away from Trump.